Now is the perfect time of the year to replace your old roof shingles. With the cold weather season behind us, late spring / early summer is the ideal time for re-shingling your roof. Re-shingling a roof, however, can be expensive. Worse yet, if it is not done right you could end up with a leaky roof and water damage to the interior of your home. So make sure to hire the right roofing contractor. 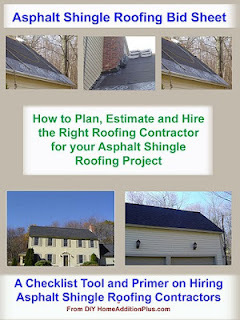 See my “Asphalt Shingle Roofing Bid Sheet” to help in this process. Also, for a quick and free roofing shingle cost estimate see my “Asphalt Shingle Roofing Cost Estimator” at HomeAdditionPlus.com. It includes features that allow you to select shingle types and various roofing options, such as installing ice and water shield, drip flashing, and ridge and soffit vents. Simply fill out the form, and instantly you’ll get an accurate roofing cost estimate. In, addition, the “Asphalt Shingle Roofing Cost Estimator” results page also includes an online form you can fill out to get free roofing shingle cost estimates from contractors in your local area. Again there is no cost to you to use the online roofing contractor form, nor any commitment to use any of the roofing contractors that contact you. So before the cold weather sets in again, get a free roofing shingle cost estimate and have your roof replaced by a quality roofing contractor. Labels: advertise your home remodeling contractor business, advertising your business, home remodeling contractor, homeowners, looking for contractors. Grow your home remodeling contractor business for free by signing up and advertising your business on HouseSight.com today. Connect with homeowners in your local area who are actively looking for contractors. 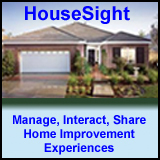 HouseSight.com registration is fast and simple, and it’s easy to use. Best of all its free. Simply upload your company’s profile information, including business website, and post a recently completed project. It’s that simple. Answer: Tony, To expand your home outwards first check to see if you have the space, making sure you meet all required setbacks from property lines and easements. Your best bet is to go speak with your local building inspector to see what the property issues may be to expand outwards. For example, if you have waterfront property on a lake you can only use a certain percentage of the land for building surfaces, e.g. 25%. Building outwards often allows you to continue to live in the home while construction occurs. Building up is not always the case. Often you need to move out for several weeks if you plan to build up. Also, if building up, the roof of the house has to come off, which means added expenses. Also, you need to see if the existing single story frame is strong enough to support a second story, e.g. 2x4 walls vs 2x6 walls. Often the ceiling joists need to be beefed up by sistering larger sized lumber to the existing ceiling joists. Over the weekend I got to try out Master Mechanic's new Rotary Tool and Oscillating Tool. Both tools are perfect for the workshop or toolbox. 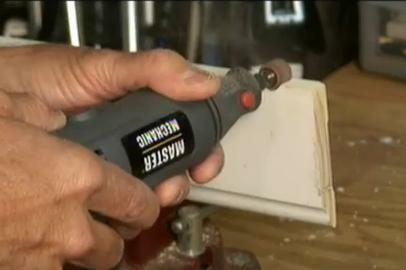 They are also ideal for small crafts projects. They are light weight and easy to hold. Changing bits is also a snap. Each tool comes with a host of accessory bits, blades and sanding materials. Look for them at True Value Stores starting on Fathers Day weekend. They can be purchased separately or as a combo pair. For a complete written and video review, see my article titled "Master Mechanic's Rotary and Oscillating Tools Review". It depends. 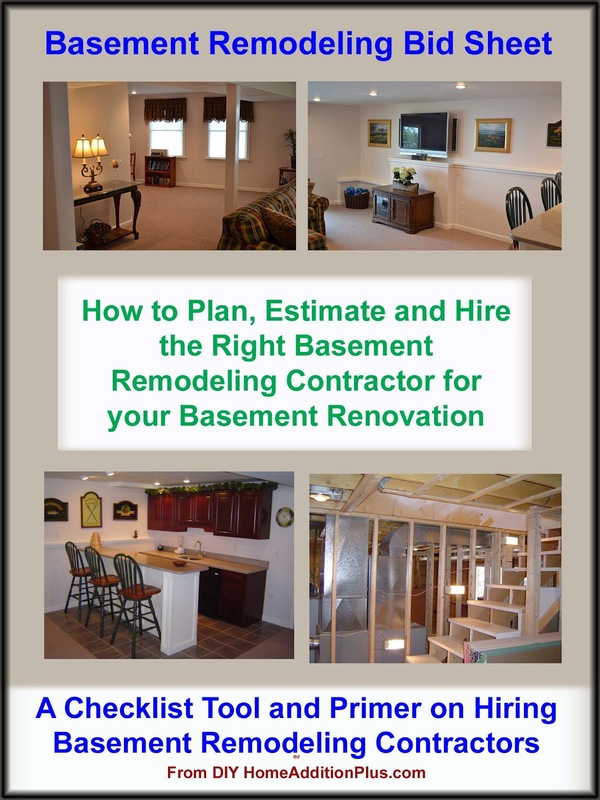 Remodeling your lower level to create a finished basement living space is typically less expensive to do than building a room addition off the side or back of your home. However, if you have major water issues around your home’s foundation then it could become quite costly to have to excavate and install a perimeter drain around the entire house foundation. If your basement is truly dry then a lower level remodel is the way to go for creating more finished living space, albeit there are some disadvantages. With a room addition, you typically can achieve more natural lighting for example. In addition, adding living spaces that include plumbing is also traditionally easier with building a room addition than finishing a lower level. Remodeling a lower level is also easier to do from an inconvenience standpoint. Finishing a basement can be a diy project that can be done at a comfortable pace without disturbing the home and family that much. Building a room addition, however, is like building a new home with the exception that the construction is going on right in your home. Consequently when building a room addition expect many inconveniences such as experiencing a lot of dirt and dust, loud noises, and people constantly walking around and through your home during the construction. Room additions are also typically much more expensive simply due to the fact that you’re effectively building a new home and attaching it to your existing one. So if you’re looking for more finished living space in your home, consider these trade-offs before deciding upon either a lower level remodel or a room addition. See my Home Addition Bid Sheets to help find a reliable remodeling contractor and to manage your home construction project. If you’re planning a bathroom renovation project, and you don’t plan on doing the work yourself, it’s important you find the right bathroom remodeling contractor for the job. Hire the wrong one and you could find yourself living through a nightmare. Common problems when hiring the wrong bathroom remodeling contractor include cost overruns, poor craftsmanship, schedule slips, extended interruptions to your home and family due to the schedule slips, and many sleepless nights. Finding a good bathroom remodeling contractor isn’t that hard to do. If you simply do your upfront homework by thoroughly screening prospective bathroom remodeling contractors for your project, you should have an excellent chance of finding a professional bathroom remodeling contractor that does quality work and is easy to work with. Hiring a good bathroom remodeling contractor starts with finding strong prospective contractors for the project. There are several companies out there that have national databases of contractors, including bathroom remodeling contractors, that they have thoroughly screened and done background checks on. There is no cost to you to use these services. Simply fill out one of the companies forms describing your bathroom remodeling project, and up to 3 or 4 contractors local to your area will get in touch with you. You have no obligation to use them and there is no cost to you for having them quote your bathroom remodeling project. If you’re interested in using this type of service just go here and fill out their form. 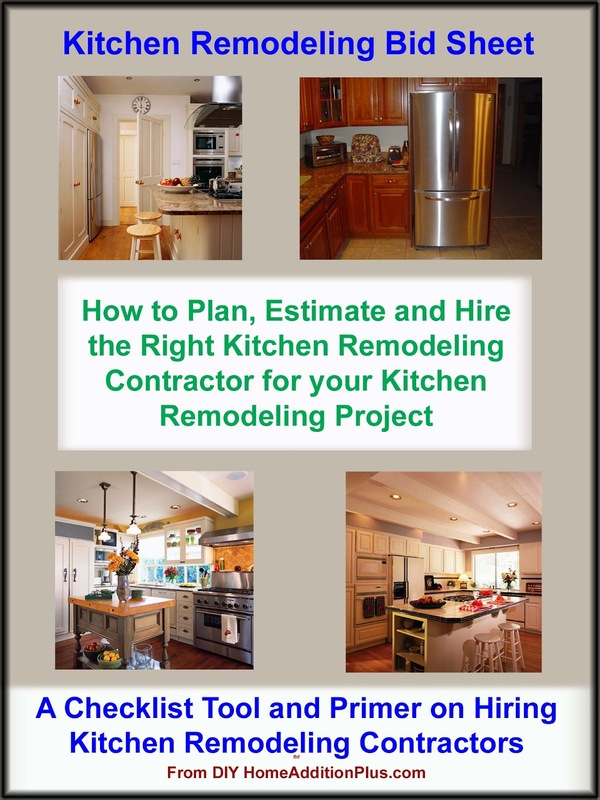 You may also want to consider purchasing my bathroom remodeling contractor hiring guide, or bid sheet. 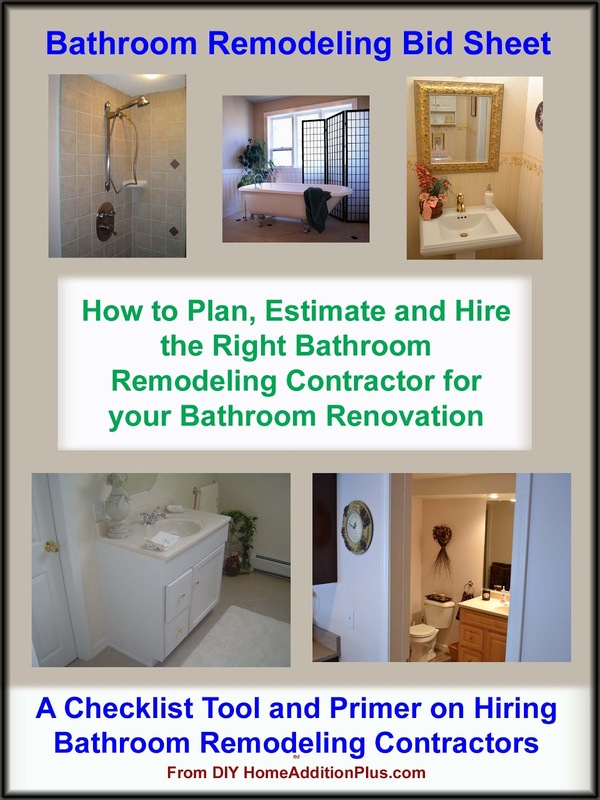 It is the perfect tool for locating and hiring the right bathroom remodeling contractor for your bathroom renovation project. It will help to ensure you hire a good bathroom remodeling contractor so that you mitigate the risks of a bad bathroom renovation project. As for the thousands of homeowners who’ve already purchased my bid sheets can attest to, the cost for the bathroom remodeling bid sheet is worth every penny. 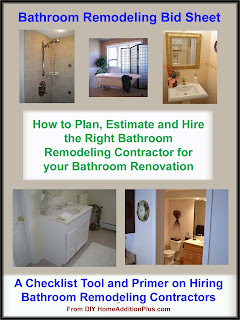 See my Bathroom Remodeling Bid Sheet at HomeAdditionPlus.com and order it today. If you’re planning a kitchen remodeling project and you don’t want to get taken for an emotional and economical ride, it’s imperative that you hire a kitchen remodeling contractor that is truly professional and ethical. Here’s how you screen for a reliable kitchen remodeling contractor. Make sure any kitchen remodeling contractor you interview is a licensed contractor in the state you live in, and confirm that they have proper insurance. Second, check with your local better business bureau or local consumer protection agency to see if there are any issues with the prospective kitchen remodeling contractor. They should also be able to confirm that the contract is indeed properly licensed in the state. Alternatively you can use a national contractor screening company to find qualified kitchen remodeling contractors in your local area. These types of companies have large national databases of contractors that they have screened for licensing, insurance and consistent quality work. Lastly interview multiple kitchen remodeling contractors for your project and make sure to check prospective contractors’ references. 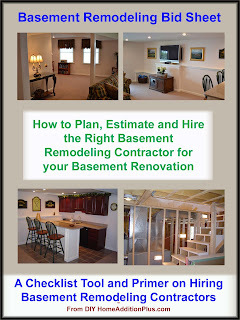 Ideally you should check 3 or 4 references for each contractor. There are certainly both good and bad kitchen remodeling contractors out there. You just need to do your homework to make sure you find the right ones that are professional, skilled and easy to work with to achieve your new kitchen. My Kitchen Remodeling Bid Sheet can also help in finding the right kitchen remodeling contractor. The kitchen remodeling bid sheet is effectively a hiring guide questionnaire that you present to prospective kitchen remodeling contractors to fill out. With the questionnaire you can compare completed questionnaires / bids between prospective kitchen remodeling contractors to get an apples to apples comparison. 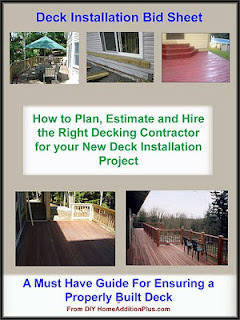 Finding and hiring a decking contractor in the spring time can be quite the challenge. Homeowners are anxious to start enjoying their decks again, and deck contractors have had all winter to book their spring schedules. Consequently spring time is the most important time of the year to be vigilant about whom you hire for installing a deck. Many guys that can barely use a hammer, saw, and carpenters square often jump into the deck construction business because the barrier of entry is so low. For the naive homeowner that hires this type of decking contractor he/she quickly learns that the only real skill the decking contractor had was the gift of gab. Deck construction done improperly can lead to many problems down the road. For example, if the deck is not properly attached to the home, water damage and rot can quickly occur where the deck attaches to the home. Also, with many new composite decking materials, joists need to be spaced on 12 inch centers. Deck installation contractors inexperienced with installing composite decking boards, or who are simply trying to save money for themselves, will space the joists at 16 or 24 inches on center. The net effect to you the homeowner is a deck that that has permanently sagging decking boards between deck joists. 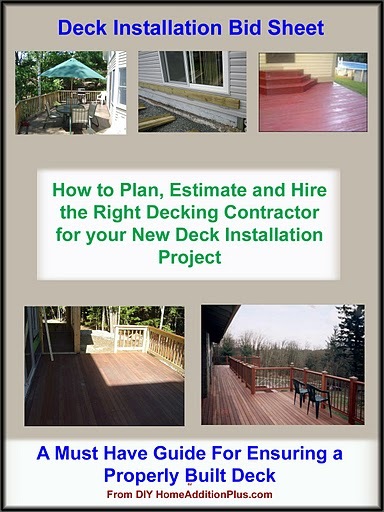 My deck installation hiring guide, or bid sheet, is the perfect tool for locating and hiring the right decking contractor for your deck construction project. It will help to ensure you hire the right decking contractor so that you dramatically mitigate the risks of cost overruns, schedule slips and major frustrations. As for the thousands of homeowners who’ve already purchased the deck installation bid sheet can attest to, the cost for this product is a mere pittance to the money they know they’ve saved by screening out and not hiring a shady decking contractor. So order my Deck Installation Bid Sheet today from HomeAdditionPlus.com, a home improvement website that has been helping millions of homeowners since 2005.